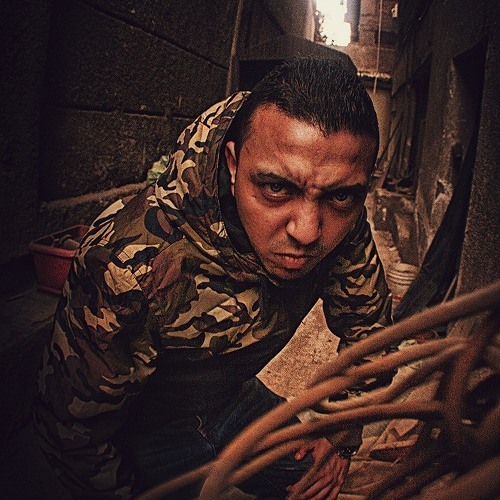 Al Moukatel known as Flow Killa/F Killa grew up in the streets of Shoubra, Egypt. His first debut was in 2006, he set up his first band, Egyskillz, with Mak-D, and released six tracks which they performed on the stage for the first time at MC.Amin’s concert in El-Mansoura. He split from the project and started his own solo conquest for the title of rap king. The one thing I admired the most about Killa is what he talks about in his raps, him talking about the issues facing Egyptian society such as poverty, politics, social issues including women’s rights, and the fall of the Muslim Brotherhood Party. His motivational song “Shebh Mosta7el”, featuring Yazz, is the best example of his brilliance in merging effective lyrics with the smooth flow to convey big messages. His authenticity about the issues going on in his community really made him who he is today. He believes in the possibility of the impossible, he says he will continue his rap career until he achieves his dream, and until the rap reaches its peak in Egypt. Something that I really didn’t like of his work was in multiple of his music videos he did not have a wide variety of colored girls, it was no type of diversity. In his raps he talks about women’s rights but in his videos he doesn’t really acknowledged all genres of women. Another critique I had for Mr.killa is that He worked with almost all the prominent rappers, groups, and pioneers in Egypt like: MC.Amin, Arabian Knightz, Asfalt, Mr.Kordy, El Zero, EgyRap School, and from the Arab Nation: La Gale, Torabyeh, Murder Eyes, Shadia Mansour, Dam, Don Bigg and Meryem Saci. Some of the artist he worked with downgrade women in their music, I wont say names but i do believe killa should influence or give advice to the people around him to uplift women in their music. Next Post: Is Maha AJ’s “Love Letter to Sudan” More Problematic than Problem-Solving?